In the fall of 1876, a new Principal, James M. Whiton, arrived at Williston Seminary. 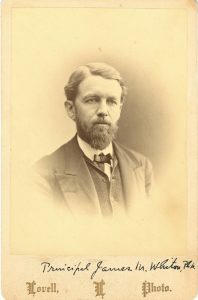 One of his first acts was to hire an assistant, Dr. Robert Porter Keep (1844-1904), at 32 a rising star among classical scholars. The two of them announced their intention to modernize Williston’s innovative dual-track Classical and Scientific curricula. This attracted the attention of Keep’s friend, the critic, author, and editor Horace E. Scudder (1838-1902). 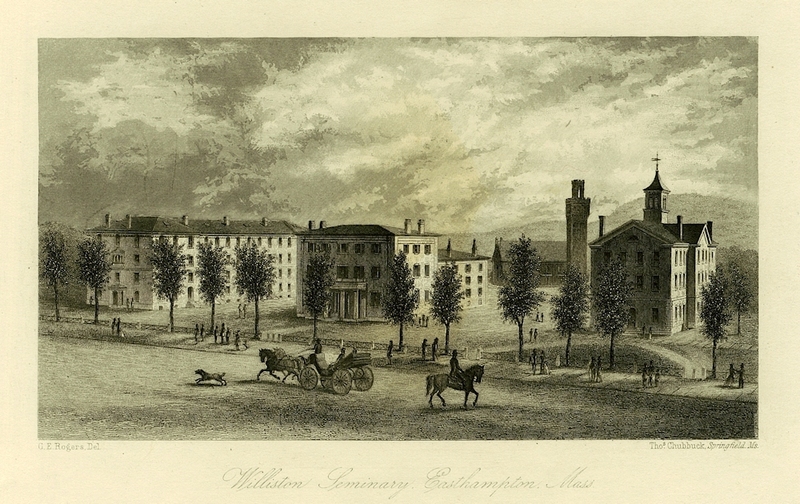 Scudder was preparing a study of New England private schools, and must have visited Williston at about this time. In his article, “A Group of New England Classical Schools,” in Harper’s New Monthly Magazine (Volume 55, June to November, 1877, p. 562-570 and 704-716), he asserted that with some curricular tweaking, particularly in the Seminary’s unique Scientific Division, Williston could join the pantheon on what Scudder considered education’s Olympus: Andover, Exeter, Saint Paul’s, and Boston Latin. 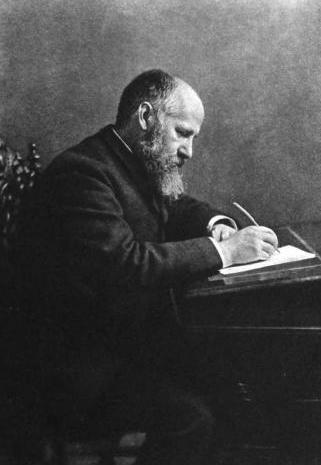 Scudder advocated adding the study of English to the curriculum. It is hard to believe today, but Williston students of the time took only one literature class, plus weekly or monthly meetings in English fundamentals. Appreciation of literature was largely absent from the Scientific curriculum. The Classical scholars got plenty of it — but solely in the Greek and Latin classics. Keep was clearly intrigued, and appears to have written to Scudder asking him to elaborate. One challenge would have been to create a framework that accommodated the different needs and backgrounds of Williston’s Classical and Scientific students. Scudder, in his long-delayed response of April, 1878, addressed this and more in the following letter. It is a remarkable document, presenting a surprisingly modern approach to the study of reading and writing. I have two pleasant letters from you unanswered, but I have been taking a little journey, and that has broken up my regular life. 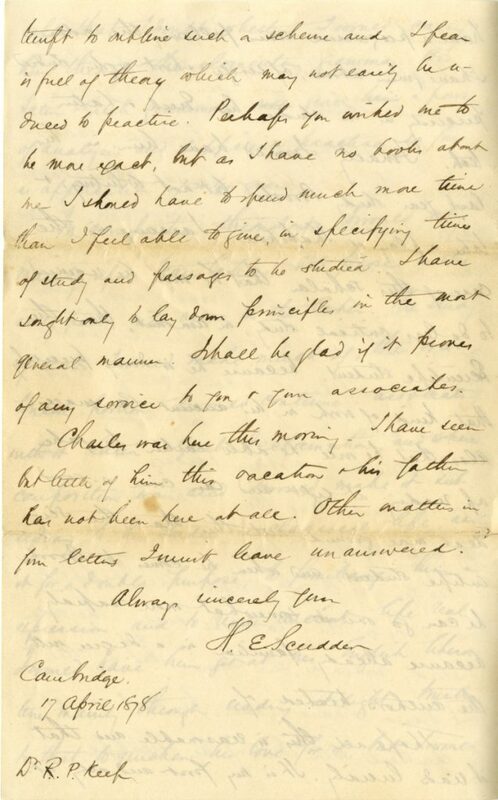 I had not forgotten my intention of writing to you on the matter of teaching English, but the more I have considered it the more difficult I find it to make any practical suggestions. It is a harder question I think at Easthampton than elsewhere because of the two classes of students. English literature as part of a liberal training would be taken differently when the students was ending his special studies and when he was beginning them. The boys who go to college not only will have opportunity later, but the very character of their early grammatical study in Latin & Greek would modify the study of English. The boy who ends his studies at Easthampton – and I suppose the great Scientific schools by no means stand to your scientific side, as the colleges do to the classical side – ought to make of English literature a substitute, in a degree, of classical literature, and to obtain from his training some of the liberalizing influences which follow from a classical course, though his age and previous studies do not give him any advantage for this over the classical student. His only advantage I conceive is that he can and ought to give more time to the study and to its cognate study of modern history. Still, with this complication, I think there might be a method which would be better than a mere desultory study with reference to college examinations, or than the somewhat haphazard method which prevails largely in our academies and high schools. First of all I would lay down the principle that literature itself should be studied and not books about literature, and in that I am sure you will agree with me as the course sketched by you indicates. Now there are three sides which literature presents, the philosophic, the historic, the aesthetic, and I conceive that each should be carried on, but that greatest weight should be given first and last to the philosophic, that the historic should be of more [regard?] midway, and that the aesthetic should be deferred as much as possible until the close of the course. The philosophic side I conceive to begin with the analysis of sentences and with philosophic grammar; the historic to begin with the history of words and with the political and social connexions of literature; the aesthetic to begin with a discrimination of forms of literature and end with conceptions of its art, in harmony with other forms of creative work. Of course a full [expansion?] of this study carries one far beyond the period of time embraced in a secondary school, but something in each development of the study may be done under the limitations of your school. Let me briefly sketch a course for a student on the scientific side, premising that English literature has to fill for him the place which Greek and Latin fill for the classical student. He would at once on entrance be set to work committing verse to memory, choosing especially the ballad form. Analyses with [Sheet 2] the aid of diagrams would be an early exercise, but as soon as he was sufficiently familiar with the terms and general method, he would be required to analyze his memorized verses without writing them. Afterward he would write out his verses from memory, and this exercise would include punctuation, capitalization, indentation, &c. I think the value of memorizing cannot well be exaggerated, and that analysis is a natural concomitant. I am greatly struck with this, when a few years ago, being much engrossed with business and having little time at my disposal, I studied the Epistle to the Romans by committing two or three verses in Greek to memory and analyzing and pondering them as I walked to my business. I found that the natural cleavage of the text furnished me with fresh interpretation and a clearer understanding. Adding the verses from time to time, I kept chapters in review and could easily compare uses of the same word or similar construction. [So? ], punctuation belongs with analysis. I doubt whether it can be taught by rote very exactly, but it can be made to point analysis, and practice will disclose the best usage. Punctuation in time helps analysis and if carefully continued throughout the course will do much to give a scholarly finish, not merely because of itself, but because of its close connexion with minute observation of good usage in other particulars. 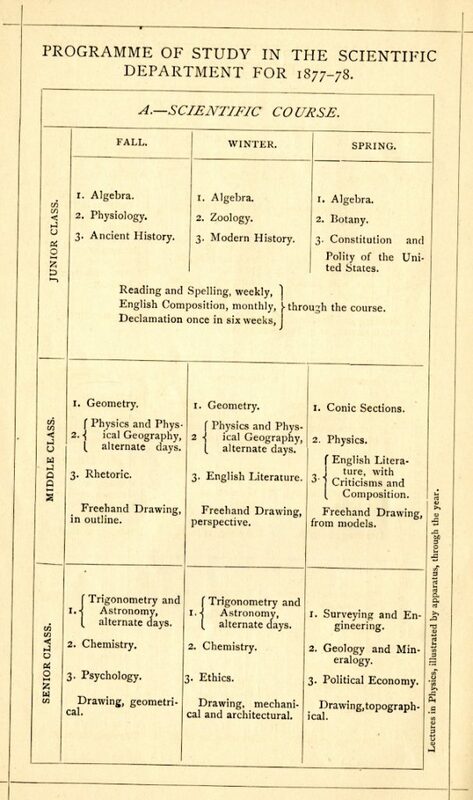 The Scientific curriculum of 1877, nearly devoid of any meaningful English study. Now following these early exercises I would take up English grammar as regards paradigms and the common constructions, and for this I am inclined to think that Reed & Kellog’s Elementary English Grammar / New York, Clark & Maynard / is as good as any, though I speak with diffidence, as I am not familiar with text books on the subject. But it seems to me clear, simple, and not overburdened with rules. Let us say that the exercises mentioned above have been continued while the boy has studied this Elementary grammar, and that the grammar has been well mastered. Now and not till now, let him take up English literature, and at this point I would begin to regard the historical side. Practice would be continued in grammatical exercise simply to such a degree as would keep him from forgetting his previous study and would familiarize him with constructions. But a new interest comes in, the interest in the words themselves which he finds his author using, and I would require him to use the dictionary freely when studying his lesson, not so much to find the meaning of a word as to find its origin. Of course he will miss a knowledge of Latin now, but he will pick up more or less in the way of the vocabulary of Latin to be of service to him, and if he is now studying French, he will have a chance for comparison. The second division of study we have now reached, and as in the first I would have the boy fed upon ballads – not necessarily the old but such as are included in modern writers – [Southey?] has written good ones, so has Longfellow, so have Scott and Whittier, and the Golden Treasury or the Ballad Book would afford abundant material. Now I would proceed with narrative poetry and legendary prose. Scott is excellent [Sheet 3] for the verse, and Evangelene [Wordsworth] might be read. For prose Hawthorne’s New England Legends rather than his Tanglewood Tales, the early chapters of Robinson Crusoe and Irving’s Legends of the Hudson. I write hastily and merely wish to indicate the character of the books I have in mind. For memorizing I would begin upon oratorical passages from the best orators, English and American, and if composition is begun, of which I am a little doubtful, I would use such subjects as an account, to be gathered from reading of the occasion of the orations. Suppose a boy for instance were to learn to speak a portion of Webster’s Plymouth oration, he could be referred to Ticknor’s account in his letters of his own listening to it and he could in his composition either describe the occasion or give some account of New England history which would justify the oration. All great oratorical efforts have a historical setting and the boy who ‘speaks a piece’ may have the opportunity of enlarging his historical study and finding a good theme for composition. In the poetry read, especially Scott, he may begin to learn some facts concerning the poet and may make such facts the ground of his compositions also. The second stage then is included in these readings and exercises and the way is open to the third. Here the aesthetic begins to open as a distinct conception, and I think it will be disclosed by two means, by attention in reading and by composition. The historical also broadens; the study of words is not discontinued, but attention begins to be given to style aesthetically considered, and style as marking a period of historic thought. In poetry I would choose contrasting elements. Wordsworth’s simpler poems, the narrative of Snow Bound & Tent on the Beach [Whittier] as being on one side, and on the other Spencer, Milton, Morris – some of the tales in Earthly Paradise [William Morris] (this may be questioned as too much of an echo of Spenser and too exclusively archaic in manner). Some of Longfellow’s sonnets. In prose, on one side Franklin’s autobiography, Sir Roger de Coverley, the early chapters of Robinson Crusoe, on the other De Quincey’s Flight of a Tartar Tribe & Joan of Arc. Some of Bacon’s essays. These contrasts give an opportunity for style to be remarked. Difference in epochs will give opportunity for grammatical study and study of words, and finally the historic connection may be quite fully studied. Prose composition may be tried in an imitative way, as following Franklin, to use only words which he uses and to deal with personal experiences & observation of men. Memorizing may be applied to each work studied, to cultivate the ear. In the final stage, English grammar is renewed, Whitney’s Essentials being carefully studied, and the pupil required to find examples in the books which he has read in the whole course; if possible, in the portions he has memorized. English prosody also is included and the pupil required to write English verse in different measures, the object being to educate his observing faculties. Of course his poetry may be poor stuff, but in no other way can he so well understand the differences in English verse. For a final study let him try to write a sonnet, and let him have Shakespeare, Milton, Wordsworth & Longfellow sonnets [sheet 4] shown him. Historically, let him now take up, say, Stopford Brooke’s Primer of English Literature, more meaty I think than Gilman’s First Steps, and study it carefully, making historical tables now and then of different periods, chronological charts & the like. In connection with this, have reading at sight from authors treated of in Brooke, and study one of Shakespeare’s histories, philologically, critically, aesthetically & historically. A good exercise would be to give out, without explaining the intention, a certain passage to be committed to memory, and then to be written out with notes by the student upon it. So far for the Scientific side. Suppose now a boy on the Classical side. The order of study would be the same. But And in the first division I have made, his work would be identical with that of the Scientific, except I doubt whether I would carry him through the elementary grammar. His Latin & Greek grammar will give him a power of analysis and sufficient practice so far as application of rules goes. In composition throughout I would rely mainly upon translation, into prose in the early part, into verse in the later. The study of words I would make much of, the oratorical portion I would continue, associating with it Latin & Greek declamation, and where composition was used I would make it subsidiary to his studies in classical life, using it for double purpose, to familiarize him in expression, and to render ancient life real. I would have him get at his English literature mainly through reading at night, trusting to that to quicken his love for it, but I would have a progressive series following the order I have given above, of single short works, studied precisely as he studies his Greek & Latin texts. Finally, I would have him in his last year study Brooke but not Whitney, & later a play of Shakespeare. I assume in the case of this scholar, that he would be required to do less critical study, in amount, than the Scientific student, because he is doing precisely that kind of work in his ancient languages. Also that he will be able to take up reading at night and can cover a good deal more ground with this than the Scientific student, and when he comes to Brooke he can go over it somewhat more rapidly because already familiar in a degree with the authors treated. I hope all this is reasonable and that it reads lucidly. It is my first and only attempt to outline such a scheme and I fear is full of theory which may not easily be induced to practice. Perhaps you wished me to be more exact, but as I have no books about me, I should have to spend much more time than I feel able to give in specifying times of study and passages to be studied. I have sought only to lay down principles in the most general manner. I shall be glad if it proves of any service to you & your associates. Charles was here this morning. I have seen but little of him this vacation & his father has not been here at all. Other matters from letters I must leave unanswered. 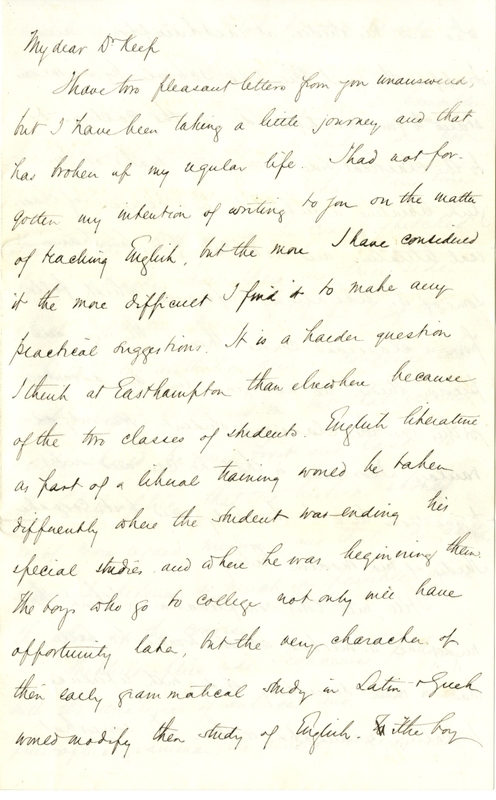 Alas for curricular reform, Scudder could not have anticipated what was happening at Williston in the spring of 1878. Principal Whiton, having combined a series of misguided decisions with an almost pathological inability to get along with anyone, was facing open student revolt. We’ll tell that tale in a future post, but for now, suffice to note that by the end of April, Whiton had been relieved of his duties, while Keep was demoted from Assistant Principal to mere Professor of Greek. 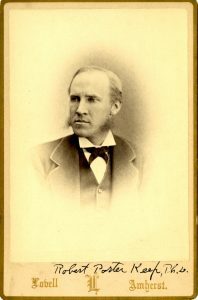 Keep would remain at Williston until 1885, and would see some of his reforms enter the curriculum, but his great success in that regard would come at Norwich Free Academy, where he was Principal from 1885-1903.